'Oleander Hotel' by the artist known as George Blattny, from the collection of Dotsie L. LeBlanc. George Blattny leans against the fence of the Oleander Hotel, right, in this undated photo found in the collection of Dotsie L. LeBlanc. 'Driftwood from the Sea' by George Blattny from the collection of Dotsie LeBlanc. 'Wind's Playmates' on Grand Isle by George Blattny, from the collection of Dotsie L. LeBlanc. 'Bain Bain Rigaud' on Grand Isle by George Blattny, from the collection of Dotsie L. LeBlanc. 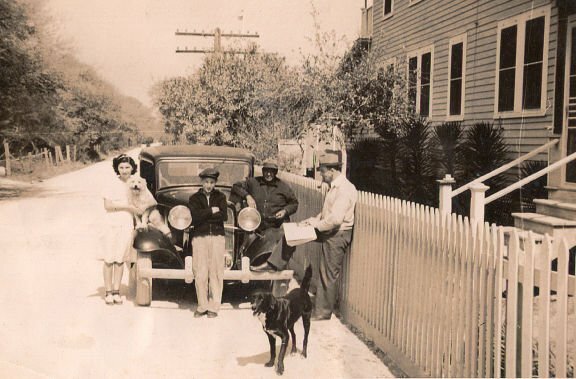 'Two Old Neighbors' on Grand Isle by George Blattny, from the collection of Dotsie L. LeBlanc. 'Madame Milliet' on Grand Isle by George Blattny, from the collection of Dotsie L. LeBlanc. A store on Grand Isle, from the collection of Dotsie L. LeBlanc, by George Blattny. In 1918, a Czechoslovakian immigrant fled his native land and came to work for a float designer in New Orleans. Between seasons, the man some knew as George Blattny decamped to Grand Isle, where he turned his paintbrushes to tales of pirates, early resorts, island customs, windswept trees and the beauty of an unspoiled place, once known as the Jewel of the Gulf. During the World War II Carnival hiatus, he relocated there full time and lived in the Oleander Hotel for $3 a day, meals included. 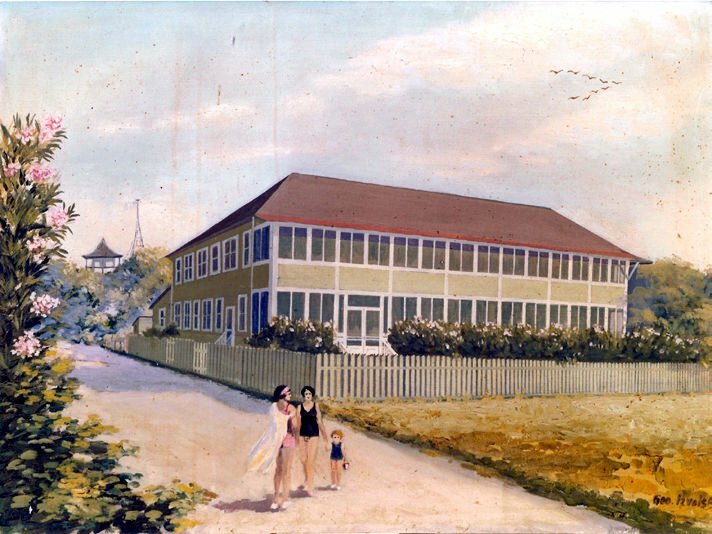 His canvases, showing Grand Isle in the 1930s and 1940s, were hanging in the Oleander Hotel on Grand Isle in 1957 when they were discovered by historian and author Dotsie Mae Langlinais LeBlanc, who owned an art gallery in Lafayette. Turned down when she asked to buy them, LeBlanc left, but she never forgot the images of the Gulf outpost as it existed long ago. Nearly 20 years later, LeBlanc returned, recalls her son, Vic LeBlanc. Amazingly, the paintings were still hanging in the Oleander Hotel. And this time, the art dealer had a camera. Dotsie LeBlanc used the photos to make prints on canvas that she mounted on board, representing them as reproductions, her son said. Dotsie LeBlanc died in 2012, leaving behind a trove of art collected in her lifetime. Now, Vic LeBlanc has made limited editions of some of those images in hopes of shining a light on the work of the artist, the past of Grand Isle and his mother's research. "The images show Grand Isle in a very different light from what most people think of it today,” said Vic LeBlanc. As for the artist, questions remain. “Blattny migrated to the U.S. in 1918 from Czechoslovakia, but no one ever got him to say why he left. ‘Political trouble’ was all you could get out of him,” Vic LeBlanc said. “No matter how much research Dotsie did into the guy, she couldn’t find out why he went by different names: Anthony Blattny, or Izvolsky or George Blattny. It’s hard to say if he was just secretive or if he was running from something. Vic LeBlanc considers himself the custodian of his mother's legacy, particularly of an unfinished manuscript called "Grand Isle Revisted," his mother's tribute to the island in the 1930s and 1940s. Although Dotsie LeBlanc never met Blattny, who reportedly died in New Orleans in 1971, she wanted to use his art to illustrate her book.